Angus McBean: Portraits is the first museum retrospective devoted to Angus McBean (1904-90), one of the most significant British photographers of the twentieth century. It brings together over 100 photographs in black and white and colour, including a large number of vintage prints from museum collections and important loans from private collections. The exhibition offers an unprecedented opportunity to see the astonishing range of McBean's work. From the striking surrealist portraits of the 1930s to his period as indisputably the most important photographer of theatre and dance personalities of the 1940s and 1950s. The exhibition also showcases his cult re-emergence as a chronicler of pop music and includes his famous Beatles covers. 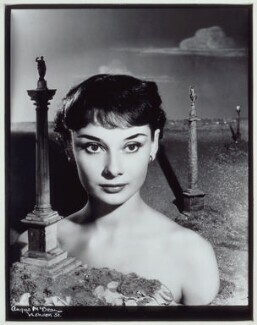 Highlights of the exhibition include the iconic 1951 photograph of the then unknown Audrey Hepburn, her head and shoulders emerging from sand - and posed amidst classical pillars. The forty-year spread of the exhibition includes more recent photographs of Derek Jarman and Tilda Swinton, while other significant portraits include Marlene Dietrich, Mae West and Katharine Hepburn. The exhibition also features several defining portraits of Vivien Leigh, whom McBean photographed many times over the course of their thirty-year association.